SpeechExec Pro Dictation and Speech Recognition Software links authors and typists, facilitating communication, the setup of individual workflow settings and organizational flexibility. Both sides can work more efficiently and get more done in less time. The solution includes an integrated version of Nuance Professional speech recognition software, for extremely accurate results. Worklists help both authors and transcriptionists monitor their work statuses. They save time used for unnecessary status update communication between parties. Files can be organized into sub folders, assigned specific properties and comments and marked as urgent to help organize and prioritize tasks. Real-time file encryption (256 bit) and secure file transfer grant only authorized individuals to access documents. The optional automatic backup function protects data against accidental loss. Philips SpeechLive cloud dictation workflow solution gives users constant file access via browser for greater flexibility and mobility. With SpeechLive, authors can dictate with their smartphone from anywhere and send dictations directly to their SpeechExec software. It also features a transcription service, where trained professionals quickly type up recordings for the author. With the integrated dictation recorder, authors can record directly into their SpeechExec software. The software works perfectly with Philips SpeechMike dictation microphones and allows for quick and easy control of all recording and playback functions such as insert, overwrite and append. Function buttons can be individually programmed for added user convenience. SpeechExec Pro allows authors and transcriptionists to automatically download all their dictations from their voice recorder straight into the software and route to the appropriate destination via their local network, FTP server, SpeechLive or email. The software comes with a conveniently integrated transcription player with pause, fast forward and rewind options. Together with the configurable Philips foot control it allows for comfortable and quick transcription. Predefined templates can be used, so documents are automatically created with the appropriate header and footer, saving you even more time. Both author and transcriptionist benefit from individual sort and filter options to find dictations and documents even quicker and always stay highly organized. Transcriptionists can receive alerts whenever new recordings are assigned to them, making sure no important recordings are missed. These notifications appear on their screen in real-time in a discreet popup window. 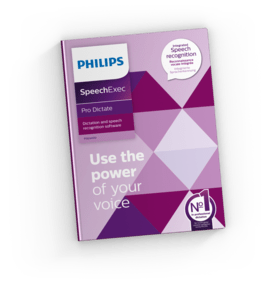 The integrated professional Dragon speech recognition software allows you to turn speech into text immediately using any Philips dictation recording devices and achieve superb audio quality, high accuracy, and easy hardware administration. The integrated speech recognition software can learn new words and commands. It also allows users to load in their existing vocabulary lists and previously saved commands, ensuring high speech recognition accuracy is achieved right away. The integrated speech recognition software supports both real-time speech recognition with dictation microphones and the transcription of audio files pre-recorded with portable voice recorders. The module for authors including the integrated dictation recorder. The module for transcriptions including the integrated player for transcriptionists. English (including variants for US, UK, Australian, Southeast Asian, Indian and Canadian), German, French, Italian, Spanish and Dutch. .wav, .wma, .mp3, .dss, .ds2, .m4a. How can I check the status of my SpeechExec license? I cannot see my dictation folders in the folder tree of SpeechExec.